And come they did. The Orcs landed a transport ship on my Northern shore, unloaded six warriors, and started attacking one of my farms. I knew I would destroy this band of ravagers, but it was a lost cause. The Orcs had a better fleet of ships than I did. They had already destroyed three of my naval vessels, and I only had three left. One I sent after the transport they used to land their warriors on my shore. My battleship would chase it off, but three Orc ships would get the jump on my one lone battleship. There was no way I could bring up another battleship to help. Nowhere to run. My fleet was down to two battleships and three oil haulers. The only good news: I killed all the attacking Orcs before they destroyed that farm, and lost none of my warriors in the process. Yes, the Orcs would come, but they would not find my ground forces or my city unprepared. Perhaps I was a bit hasty in my defeatist attitude. I just assumed that they had a fleet large enough to control the sea. But, as my gold and lumber went up, I was able to build more ships. No one attacked me, save an Orc warship that I destroyed fairly quickly. So now I’m back up to a fleet of seven warships. Three transports. And a ground army ready to invade. Perhaps now is the time to attack the Orc city? This is the premise behind Blizzard’s latest Macintosh game, Warcraft II. Game play is VERY easy, and the fun never stops. Unlike some games in which you must learn twenty different keys to control game play, all you need in Warcraft II is a mouse. You simply click on one of your men, and tell him what to do. Say you click on a peon. That one worker is now in a blue square. He will answer “Yes, M’Lord” or “What is it?” in a half wit tone. (He is a peon, after all!). You then select the action you want him to do, and he does it. Point to the mining/lumber button, select where you want the peon to go, and off he goes. A warrior is equally simple to use. Drag a huge square over, say, five warriors, click the attack button, then click the advancing Orcs, and watch them move off to smite your enemies. They will even answer you in a hearty “At once, sire!”. One of the best features of Warcraft II (and the first Warcraft) is the ability to play the game over a network or modem. I tested the modem play against Mike Gault, both running a 28.8 Global Village Modem, and found the game speed excellent. No drop in performance at all. You may, if you only have a 14.4 modem, experience a markedly slower game play. I tested the three level demo game of Warcraft, as the full version is not yet available as of this writing. (Due out by the time you read this). 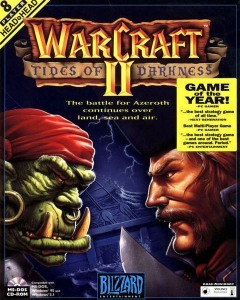 You can download this free demo from http://www.blizzard.com, as well as a demo of the first Warcraft. I plan to buy this game the day it comes out, as I am sure many of you will after playing the Demo. Again, run, don’t walk, to your nearest software store, and buy Warcraft II. Support those vendors that are creating quality Macintosh games, and insist that they release the Mac versions when they release the Windows version. Warcraft II has been out on the Windows platform for a long time. Demand better games, and support them. Warcraft II fits both those demands. Buy it today.